Interstate 55 and U.S. 61-64-70-79 cross the Mississippi River on the Memphis-Arkansas Bridge built in 1949. The cantilever truss bridge does not meet modern Interstate standards due to its lack of shoulders. 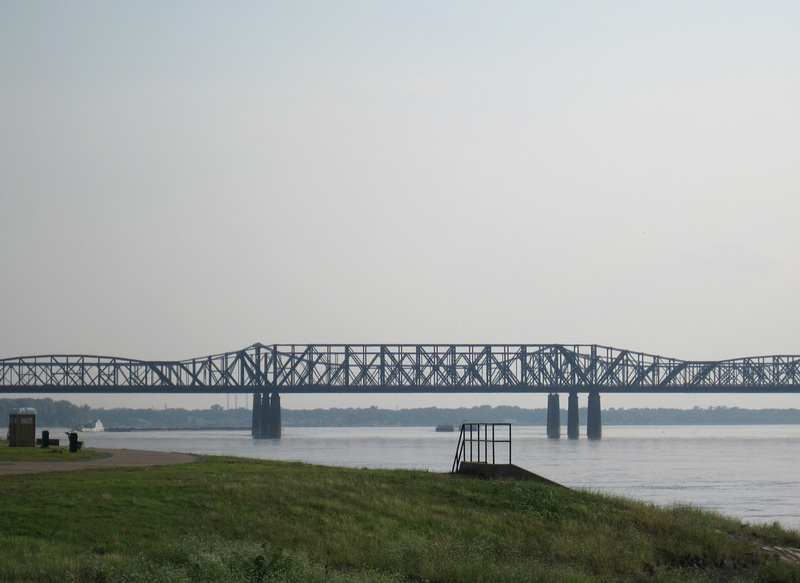 However, this span is the only Interstate Highway bridge in Tennessee included in the National Register of Historic Places.1 I-55 crosses the Mississippi River again on the Poplar Street Bridge that connects St. Louis, Missouri, with East St. Louis, Illinois. Photo taken 06/01/10. Interstate 55 parallels the Mississippi River for much of its length. The route originates at Interstate 10 outside the city of La Place, located west of New Orleans in the Delta region. The freeway runs northward along an isthmus between Lakes Maurepas and Pontchartrain between LaPlace and Ponchatola. This section of Interstate 55 is elevated. Meeting I-12 at Hammond, I-55 transitions into a forested freeway to McComb and Brookhaven in southern Mississippi. Reaching the capital city of Jackson, Interstate 55 briefly joins Interstate 20 to turn east across the Pearl River. The freeway resumes a northward heading east of Downtown to Ridgeland, Madison and the north Jackson suburbs. Again a rural freeway, I-55 continues to Grenada, Senatobia, Hernando and the southern periphery of the Memphis metropolitan area. 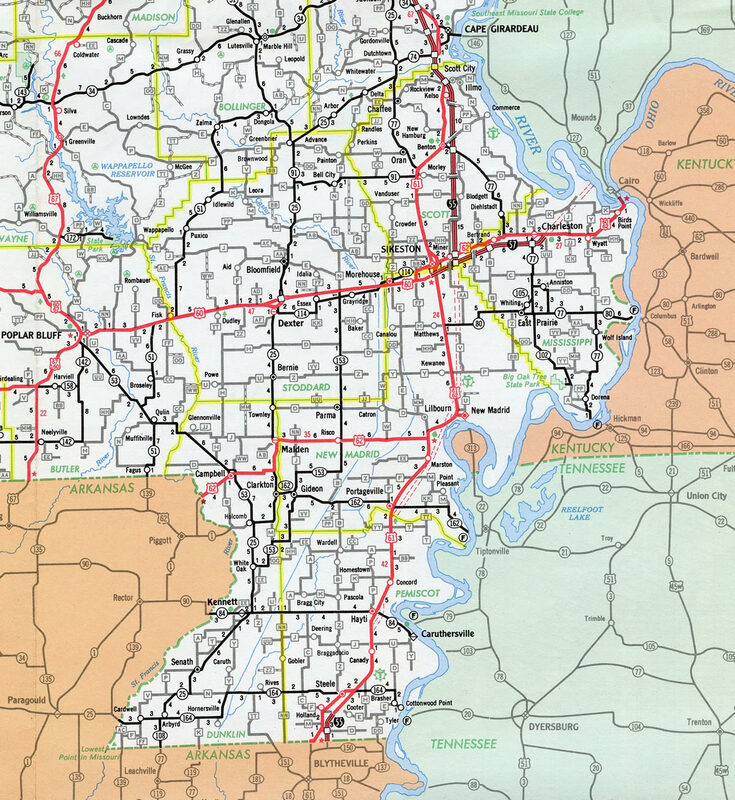 As of May 6, 2008, Interstate 55 combines with Interstate 69 from north of Hernando to the city of Memphis and the exchange with Interstate 240. I-69 follows I-240 north to Downtown Memphis while I-55 swings westward to span the Mississippi River via the Memphis & Arkansas Bridge. Along this stretch is a cloverleaf interchange with Crump Boulevard that includes a turn off to stay on (TOTSO) mainline movement for I-55. Construction originally anticipated through 2019, and temporarily on hold, addresses this substandard connection. Interstate 40 combines with I-55 for two miles at West Memphis. 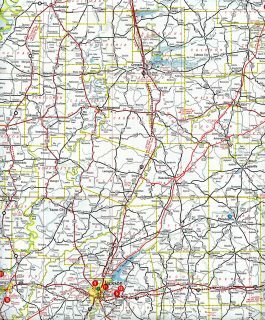 The two trucking corridors partition with I-55 turning north to Marion and Blytheville and the Missouri state line. 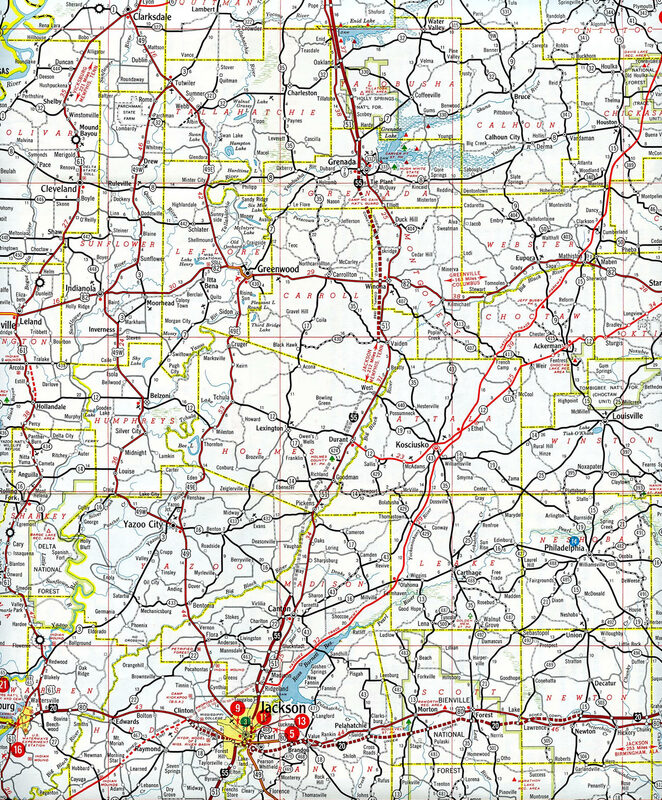 Remaining rural, Interstate 55 progresses northward to Hayti (I-155), New Madrid, and Sikeston (I-57). Some through traffic bound for Chicago diverts via Interstate 57 while I-55 stays west of the Mississippi to St. Louis. Beyond Cape Girardeau, Jackson and Festus, all served by Interstate 55 business loops, travelers along I-55 enter the St. Louis suburbs to Mehlville and the exchange with I-270 and I-255. These routes double as bypasses and commuter routes while I-55 stays north into Downtown St. Louis. Crossing the Mississippi River for a second time, I-55 joins Interstate 64 & U.S. 40 from near the Gateway Arch into East St. Louis. There I-70 ties in from the 2014-opened Stan Musial Veterans Memorial Bridge to replace I-64 as the northbound counterpart of I-55 to Troy. The remainder of Interstate 55 through Illinois replaced U.S. 66. Most stretches of Old U.S. 66 are marked as an historical route, and stretches through both Springfield and Lincoln double as Business Loop I-55. 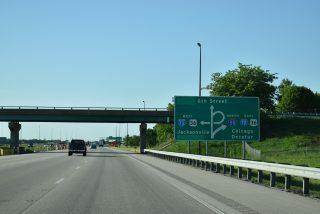 The freeway overlaps with Interstate 72 through the capital city of Springfield before angling northeast to Lincoln, Bloomington and Normal. Interstate 74 combines with I-55 to the west of Bloomington while I-39 ends from the north at Normal. Interstate 55 continues northeast from there to Joliet (I-80) and the Stephenson Expressway leading into Chicago. The northern terminus of I-55 is in Downtown Chicago at Lake Shore Drive (U.S. 41) near the sprawling McCormick Place, the city’s convention center. Interstate 55 parallels U.S. 51 from New Orleans north to Memphis, then follows U.S. 61 from Memphis north to St. Louis. Between Memphis and St. Louis, U.S. 51 remains east of the Mississippi River, while Interstate 55 stays west of the river. Once at St. Louis, I-55 replaced U.S. 66 all the way to Chicago. U.S. 51 and Interstate 55 meet again at Bloomington-Normal, and U.S. 51 north of that city has been largely subsumed by Interstate 39. 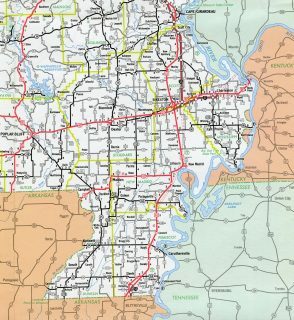 Through southeastern Missouri, Interstate 55 was completed initially at the Arkansas state line and from Sikeston north to Jackson. Interstate 72 east combines with I-55 north for 5.1 miles around the southeast side of Springfield, Illinois. The overlap is not acknowledged on the FHWA Route Log and Finder List. Photo taken 05/24/18. Exit 293A departs from I-55 north to Cermak Road and Chinatown. The Stevenson Expressway continues 1.25 miles further to U.S. 41 (Lake Shore Drive) by McCormick Place, Chicago’s convention center. Photo taken 09/03/05. I-55 navigates through an S-curve below the freeway spur linking the Dan Ryan Expressway with Cermak Road. The ensuing exit joins the Stevenson Expressway with Dr. Martin Luther King, Jr. Drive. Photo taken 09/03/05. The final reassurance shield for north Interstate 55 stands beyond the Cermak Road exit below the Rock Island Railroad overpass. Photo taken 09/03/05. State Street passes over Interstate 55 on the half mile approach to U.S. 41 (Lake Shore Drive). Exit 293D leaves in a quarter mile for McCormick Place. Photo taken 09/03/05. Construction in 2016/17 rebuild the directional T interchange with U.S. 41 (Lake Shore Drive) so that two lanes now connect with the route south along the Lake Michigan shoreline. Photo taken 09/03/05. Advancing east along side McCormick Place toward the flyovers for U.S. 41. While Lake Shore Drive travels at-grade within the vicinity of Interstate 55, U.S. 41 upgrades to a freeway to the north of Downtown Chicago. Photo taken 09/03/05. U.S. 41 (Lake Shore Drive) heads north from I-55 to Soldier Field (home of the Chicago Bears), the world-renowned Shedd Aquarium, and Grant Park. All trucks are required to take the southbound ramp toward the Douglas and Hyde Park neighborhoods. Photo taken 09/03/05. End shields for I-55 were posted along the previous flyover ramps to U.S. 41. A new assembly appears at the gore point separating traffic as of 2017. Lake Shore Drive was once proposed as part of an Interstate 494 downtown loop. The highway never came to fruition as it would have involved serious alteration of the Lake Michigan waterfront. Photo taken 09/03/05. One mile ahead of the directional T interchange with Interstate 55 (Stevenson Expressway) on U.S. 41 (Lake Shore Drive) south. Photo taken 09/03/05. A diamond interchange connects Lake Shore Drive with 18th Street and Museum Campus Drive a half mile north of Interstate 55. Photo taken 09/03/05. U.S. 41 (Lake Shore Drive) runs along side McCormick Place Convention Center to the off-ramp for Interstate 55 (Stevenson Expressway) south. The Stevenson Expressway generally parallels old U.S. 66 en route toward Joliet. The initial interchanges along I-55 connect with State Street and the Dan Ryan Expressway (I-90/94).Photo taken by Chris Patriarca (05/25/03). A pair of assemblies formally marked the southbound beginning of Interstate 55 within the exchange at Lake Shore Drive. A small guide sign replaced these by 2016. Photo taken 09/03/05. U.S. 41 (Lake Shore Drive) northbound passes under the 35th Street Pedestrian Bridge one mile ahead of Interstate 55’s northern terminus. Photo taken by Dan Garnell (08/28/03). A two-lane flyover leads motorists from Lake Shore Drive north to Interstate 55 (Adlai E. Stevenson Expressway) southbound. The control city is St. Louis, although I-55 connects to Joliet and several downstate cities, such as Bloomington-Normal, Lincoln and Springfield. Photo taken 09/03/05. Six miles separate Rudduck from the southbound split of U.S. 51 from Interstate 55 to LaPlace. Photo taken by Chris Patriarca (05/13/03). Interstate 55 south defaults onto Interstate 10 east to New Orlenas. A Breezewood connection utilizes U.S. 51 south from Exit 1 for I-10 west to Baton Rouge. Photo taken by Chris Patriarca (05/13/03). Entering the half-diamond interchange with U.S. 51 south and Old U.S. 51 north along Interstate 55 south. I-10 travels ten miles east to Kenner and along the north side of LaPlace nearby. Photo taken by Chris Patriarca (05/13/03). Crossing over southwestern reaches of Lake Pontchartain, Interstate 10 advances two miles west to Exit 210 with I-55 north. Interstate 55 commences along a viaduct, continuing the stretch of elevated highway along I-10 another 23 miles to Pontchatoula. Photo taken by Steve Hanudel (08/15/05). Continuing west over wetland areas, Interstate 10 approaches the elevated wye interchange (Exit 210) with Interstate 55 north. U.S. 51 combines with I-55 northward from La Place to Ponchatoula. The parallel old alignment remains drivable. Photo taken by Steve Hanudel (08/15/05). Two lanes separate from I-10 west for Interstate 55 north to Hammond (I-12) and Jackson, Mississippi. The succeeding off-ramp connects with U.S. 51, which branches southwest from I-55, 3.3 miles to its end at U.S. 61 in LaPlace. Photo taken by Steve Hanudel (08/15/05). Interstate 10 passes just north of suburban areas of LaPlace to a diamond interchange (Exit 209) with U.S. 51. U.S. 51 extends northeast from U.S. 61 along an arterial route to adjacent ramps with I-55. Photo taken 05/09/15. Exit 209 represents the last services for either I-10 east or I-55 north for a substantial distance as both routes elevate across areas around Lake Pontchartrain. U.S. 51 combines with Interstate 55 north for 25 miles to Pontchatoula. Photo taken 05/09/15. There is no direct access from Interstate 10 east to Interstate 55 north. Instead motorists must navigate along U.S. 51 north from Exit 209 to complete the movement. Photo taken 05/09/15. U.S. 51 leads north from the ramps at I-10 a short distance to combine with Interstate 55 toward Hammond. Old U.S. 51 parallels to the east side of the elevated freeway through Ruddock and Manchac. Photo taken 05/09/15. The first confirming marker for Interstate 55 north appears along the ramp from I-10 west at Exit 210. Photo taken 11/20/08. Tennessee Interstate System at 50: Facts and Trivia http://www.tninterstate50.com/Tnfacts.htm. “New Highway Stretch Open.” The Southeast Missourian, September 2, 1960. Vintage St. Louis, online posting. Facebook.com. July 14, 2013. Chicago Timeline: 1964 Southwest Expressway Opened; September 1, 1965–Renamed Adlai E. Stevenson Expressway, Chicago Public Library, updated August 1997 http://www.chipublib.org/004chicago/timeline/stevensonx.html. Interstate Highway 55, Adam Froehlig.